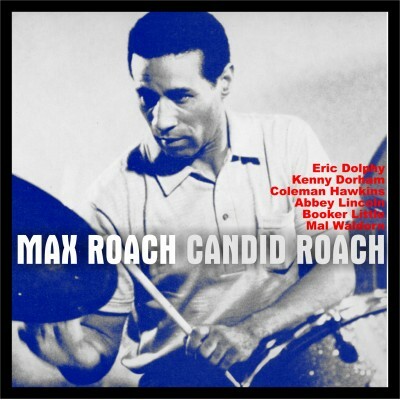 Max Roach listened to and took inspiration from all the great black swing drummers of the era, including Sid Catlett, Jo Jones and Kenny Clarke. Max got out and about, graduating from playing with Coleman Hawkins at Kelly's Stables to Dizzy Gillespie at the Onyx in 1944 and subsequently Miles Davis and Charlie Parker. Roach was soon participating in many record sessions for the new wave of independent labels which sprang up in the forties. He became the man on the block. Alongside the new bop movement which sought to break free from the constraints of the more rigid swing music,so was developing an even more significant aura of change-the civil rights movement seeking to open up equal status and opportunities for black people. Max became a prominent force in this activity and found an ally in Nat Hentoff ,the prominent author.critic/columnist and now record producer with a political voice to rival Roach’s. 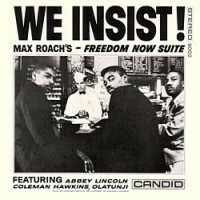 Hentoff commissioned Roach to record several records for the Candid label in the 1960s including the now iconic “We Insist!/Freedom Now Suite” from which Freedom Day is included here.